After my presentation at OpenEd, David Wiley said he wished he hadn’t gotten a call in my session because he wanted to ask a provocative question: How was what I was doing with OER different from Pinterest for text? He said he thought he knew the answer to that, but would have liked to hear me articulate it. I replied that I’d *love* to be compared to Pinterest, which is a huge inspiration to me. In fact, I’ve long thought that Pinterest is the most successful OER sharing engine in existence. In K-8 education, Pinterest is *the* OER platform; everything else is a rounding error. This is partially because pictures are just more natively shareable than text on the web, but it is also because the metaphor is one of copying resources into one’s own space. This is made grokable to the user by treating these spaces as “boards” where multiple resources exist for collection and tagging. (In fact, Ward Cunningham talked a bit about the Pinterest metaphor as a direction that community visualization could go). 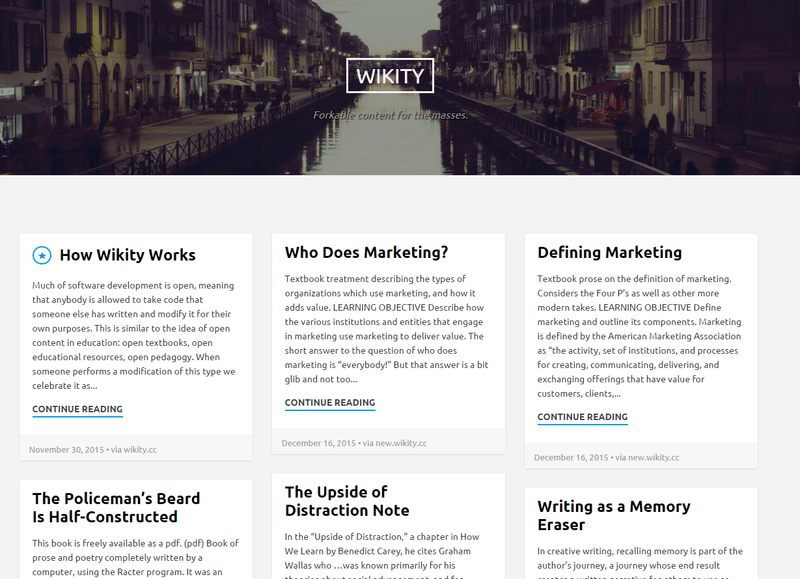 The differences between Wikity and Pinboard? Pinterest doesn’t do hypertext. These pins are saved, but they are not *linked*. These are not small distinctions — in building an open framework they represent core ideas. If you imagine some sort of sliding scale of open architecture, Pinterest is far closer to Facebook than Wikity. We share a metaphor, but not an architecture or a philosophy. True, said David — but maybe you could start the conversation from Pinterest, and you’d get further. Right now the federated aspect makes it hard to provide certain functionality from the front page — you can’t copy without going to the article in question first, etc. But these issues are probably surmountable. I was talking with Jim Groom yesterday, and he wondered if we could push the metaphor even further, and have the individual sites have a default view like this too. And the more I think about it, the more I think we are going to have to do that. If we do do that, we might have to contend with the issue of forking before reading. We’ve generally assumed that people read an article and then decide whether to fork it to their site. But another interesting pattern might be to go on a quick foraging session and fork everything that looks halfway interesting to a working space which gets pruned later. Maybe I make a site called mike-toread.wikity.cc and I just scan quick and dump everything in there. I kind of like this idea, because it radically reduces the stress around copying. You copy a resource into one space to read it — if you copy it to some of your other spaces, *then* it maybe means you think it’s good. I’m also increasingly thinking that even individuals are going to want a multisite installation — that people may use different sites like different boards. But it may also be that use of tagging fills those needs, so that will be something to watch.